For sometime, we’ve fussed with juicing lemons. No more! Well at least not when it comes to roasting asparagus. Let the lemon slices do the work for you. Preheat oven to 375. Toss asparagus in olive oil and sea salt and line in a single layer in an oven-proof pan. Layer lemons on top in a single layer. Roast until asparagus is tender, about 10 minutes. This entry was posted in Dinner, Food, Recipes, Sides and tagged baking, quick, roasting, side dishes, vegetables, vegetarian. Bookmark the permalink. Asparagus are not available yet here. Been craving them for months! What a great idea! I can’t wait to try it. I’ve got some “aspergrass”, as my Southern neighbor used to call it, in the fridge right now. Dinner! 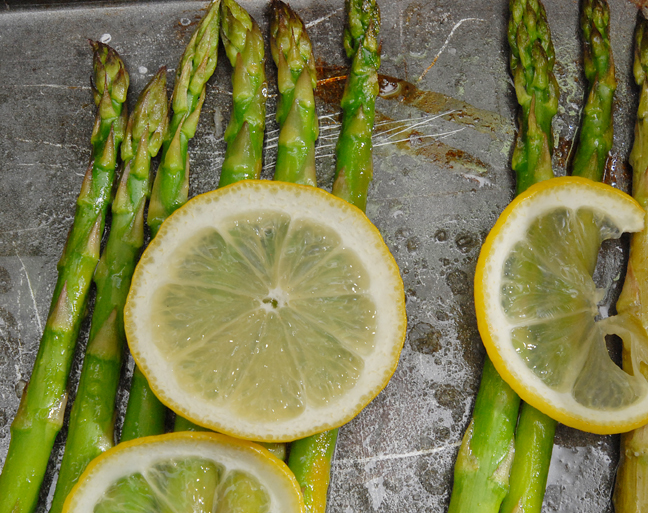 I love roasting asparagus but have never thought to add lemon slices. Great idea! Looks delicious. Genius ! I love roasting asparagus it seems to keep so much more of the flavour than when people boil or even steam them and they’d taste so good with the lemons. I love this idea for roasting asparagus. Thanks! This is my favorite way to do asparagus. I even eat the lemons. Yum! Looks like Spring is here. Lemons and asparagus, yum. Do you pick them up and eat them with your hand? Ohhhh, yum! It’s not asparagus season up here yet, but this recipe will certainly be making an appearance when the season starts. Lemons should be your best friend and you should not be fighting them lol. And these.. came out perfect! We are just getting the first asparagus here and I love the taste of roasted lemons. Just never thought to put them with asparaus. Great idea! Asparaus…what the heck is that?! Asparagus!! I’d forgotten about asparagus since last year’s crop. Nice reminder, nice recipe. I love asparagus and roasted is great and then with lemon and roasted, well that is just delicous. Love the contrast of the vibrant green and beautiful yellow. I started roastin asparagus a couple of years ago, and that’s the only cooking method I use anymore…love the lemon addition. We’ll give that a try as soon as it comes into season up here! This is exactly the flavor combo I am craving right now…clean, crisp and delicious. Ah, spring, it’s not far away now when asparagus will be abundant! Lemon and asparagus is a wonderful combination. You have asparagus season now? I love this simple and appetising recipe. How smart is this! We’ve been fussing with lemons, too, but this makes so much sense! Thanks! Love this recipe – it’s my favorite way to eat asparagus. Love the simplicity. I have never just left the lemons on top like you have shown us. This is a brilliant idea! Your asparagus looks gorgeous! looks awesome and very fresh! Asparagus needs nothing fancy, and this recipe is a perfect demonstration of that! Looks delicious. Thanks for sharing. You have a great blog and I’m glad to have found you! Thanks, glad you stopped by and I’ll return the visit soon! The asparagus is due anytime and when it arrives will make sure to get lemons too, love the idea! I love roasted asparagus, love the addition of lemon! Sometimes it’s the simplest things that are staring us directly in the face that we don’t see. What a great time-saver and it looks gorgeous too. great idea; way to keep it simple! Mmmm, asparagus. I need to get some. I made this last night as for a starter for supper. Excellent. Love, love, love asparagus any way you make it. This looks great. We like it on the grill, too. Roasted asparagus is my favorite way of eating it – add to that a roasty lemon and coarse sea salt and you’ve got a simple, pretty and delicious winner! Love it! I love both lemon and asparagus…sounds so good! I would really like to use this recipe in the newsletter I create at work. You would of course get full credit and the address of this blog would be included. Please send an email to laura@greentree.coop ASAP if you would allow me to do this. Thank you! Made this tonight and loved it! Thanks for the great recipe! Awesome, thanks for letting us know!